All of us at La Costa Limousine are delighted and humbled to take this year to celebrate our 30th year in business! As we reflect on the past three decades serving San Diego County and southern California, we are truly grateful to our customers for their loyalty. When La Costa Limousine opened in 1989, limousine companies specialized in providing high-end transportation with excellent customer service. Today in 2019, a lot has changed in terms of vehicle options, technology, and markets, but La Costa still provides the best in ground transportation and superior customer service. After thirty years, our founders Rick Brown and Dale Theriot are filled with gratitude as they look back over three wonderful decades. 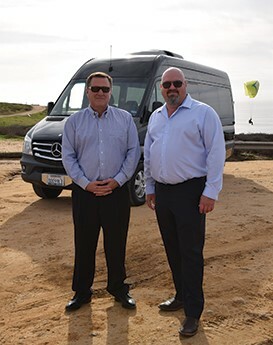 Before opening La Costa Limousine, Rick owned a thriving mobile auto detailing business. He realized that his client base would also be an ideal target market for limousine service. Rick discussed his plan with Dale Theriot, and they decided to go into business together. As Rick says, “This was the 80’s—running a limousine company was going to be fun!”. And it was! Starting with one vehicle, Rick and Dale did it all—driving, answering the phones, maintaining the limousine, and marketing the business. After nine months, they had two cars, and the next year they hired another chauffeur because they now had three vehicles. Rick’s dream was to own five vehicles. It can be hard to operate as a 12-15 car business, but we were able to fly through those potential growing pains. We landed the Dav El account which brought us a lot of business. We had stretch limos running to Los Angeles and back all day long and on the weekend, seven days per week. Our per-car revenue was incredible. In 2005 La Costa won the coveted Operator of the Year award. But every business faces challenges, and the financial crisis of 2007-2008 hit us hard, as it did just about everyone in the industry. We weathered the tough times and adapted to stay financially strong. Today we have 60 vehicles and 130 employees serving all of San Diego County, Los Angeles, Southern California, and nearby states such as Arizona. When Rick and Dale look back at what enabled La Costa to thrive when so many companies have failed, they know exactly what has set us apart. We offer top-of-the-line service and have never tried to be the cheapest, because people will pay for quality. No service provider can be perfect, but when something goes wrong, we do whatever it takes to make it right. Thirty years in the limousine industry in California have given Rick and Dale many memories and a lot of great stories. Rick recalls the client who lived at an exclusive resort and booked limo service every day to do her errands—including trips to Target so she didn’t overpay for socks at the resort! Another client booked a limousine to take him and his dog from San Diego to Toronto for a family reunion: all told, the round trip took two weeks for him and his dog. La Costa is fortunate to have a number of clients who have been with us since the beginning, including some special friends who recently celebrated their 60th anniversary with us. Rick and Dale are grateful for the opportunities and the success they have had, so they give back to the community and their employees. La Costa donates regularly to charities and fundraisers. Our special passion is the Make-A-Wish foundation, and we have been honored to provide more than 2,500 rides for deserving children. Rick and Dale are proud of the many employees who have worked for La Costa for a long time, including two office staff members who have been there for over 20 years. As they look to the future, Rick and Dale have some exciting plans, but more than anything, they intend to keep providing the stellar service that has built their reputation. They are careful to make decisions that will play to their strengths, serve our clients well, and set La Costa up for many more decades of success. We'd love to hear from you. There are always agents available to take your reservation or apply your last minute changes.